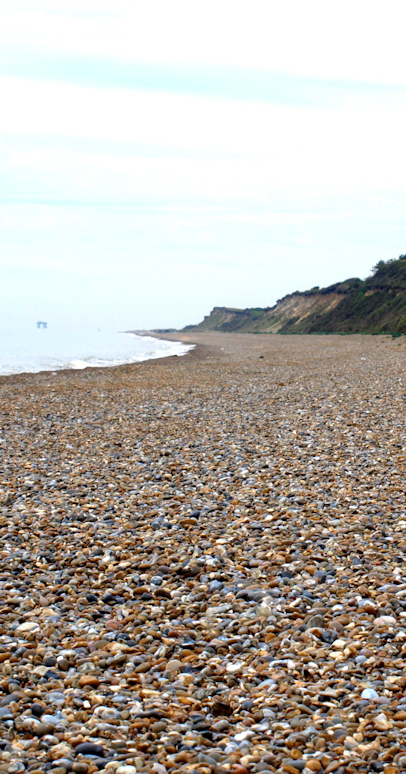 The car park at Dunwich is deserted this morning, apart from a solitary dog walker. The dog bounds onto the beach, all enthusiasm and wagging tail, then dashes back towards his master. “He wants you to keep up,” I remark, innocently. Affronted by this comment on his agility, the man tells me how he has Achilles tendonitis and is still under doctor’s orders to rest but is fed up with resting. I allow him to walk ahead of me. The morning is beautiful. The sea is calm, dead flat and light grey. There is a milky haze on the horizon and I cannot tell where sea ends and sky begins. The light is pearly and the word “opalescence” comes to mind. It is the kind of light you see in Venice. Magical. I walk along the beach. It is all shingle – big loose stones – and the going is very difficult. On my right is a low cliff. Officially, the Suffolk Coastal Walk follows the line of the cliffs, but there is no sign of a path. I walk as close to the waves as I can, where the wetness of the stones seems to make them firmer. After a few minutes I am sweating. I overtake Mr Achilles and his dog. The dog bounds ahead with me for a while. When I look back, later, they have gone. A few other dog walkers appear ahead of me and pass me, heading back to Dunwich. Now I am alone. There is a sailing boat to my left, far out to sea. In this strange milky light, it appears to be floating in the sky. Ahead of me, the bay curves towards the ghostly outline of the dome of Sizewell power station, in the far distance. Behind me, the bay curves back to Southwold, becoming fainter behind me as I continue walking. I have been walking for an hour and seem to have made little progress. To cheer myself up, I have a drink of water and eat some chocolate. I begin to think about my aches and pains. There is an ache on the outer aspect of my left hip. Because I am walking on slanting shingle, I put more pressure on my left leg. Walking slightly pigeon-toed helps to relieve the discomfort. Then I notice the blister under my right fourth toe is still troubling me. I popped it last night, which usually solves the problem, but it must have reformed with fluid overnight. I begin to notice a discomfort in the joint of my big toe, right foot, too. This gives a stabbing protest every time I walk over a big piece of shingle. Being a medical doctor carries a penalty – hypochondria. 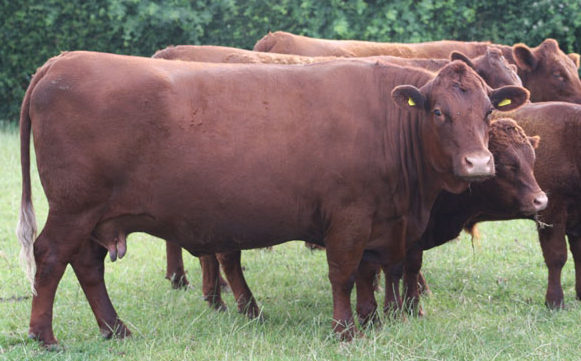 My hip pain must be due to tronchanteric bursitis or early onset of severe osteoarthritis. My toe joint is obviously developing gout or, at the very minimum, bunion trouble. My mind dwells on all the problems that can interfere with mobility – plantar fasciitis, Achilles tendonitis, ankle arthritis, knee arthritis, hip problems, low back pain. Even shoulder problems, such as shoulder tendonitis or the evil frozen shoulder, could handicap me as I would be unable to swing my rucksack onto my back easily. While I ponder the miracle of my apparent fitness, despite a multitude of possible ailments, time passes and I make my slow progress along the shingle. I notice the remnants of buildings on the cliff. At one point, I see a whole section of roadway dangling down the slope – further evidence of the power of the sea. After this, the cliff becomes lower and disappears. I see there are people ahead on the shingle, the first people I have seen since I left the dog walkers behind. 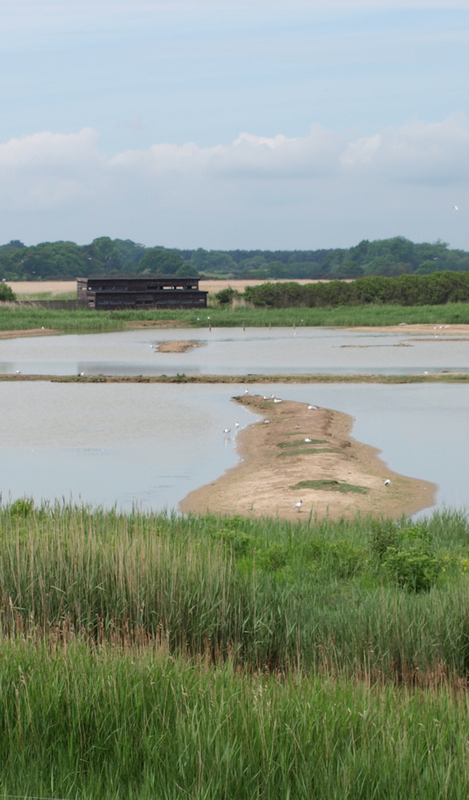 I notice a “visitor centre” is marked on my map and I am coming to an area of inland marshes called Minsmere Level. I leave the shingle beach and head inland, finding the track of the official Suffolk Coastal Path. Here a mystery is solved. 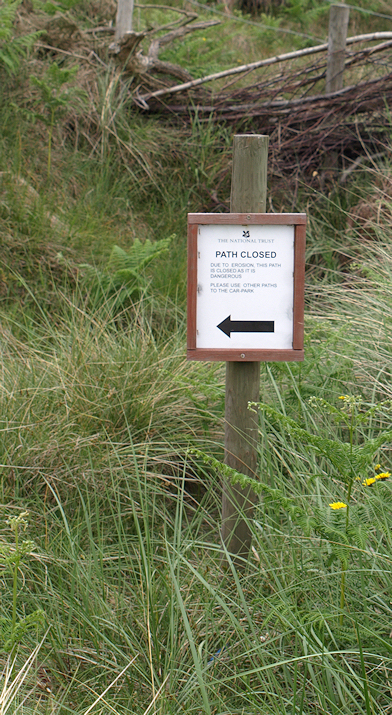 There are notices saying the path to the North is closed due to cliff erosion. This explains why I couldn’t find an easy route along the beach. But now the path is welcomingly broad and the going is easy. My aches and pains improve. I meet people out walking, most of them armed with binoculars for bird watching. I notice that most people are elderly. This could be because it is June and everyone else is at school, work or university. Or maybe the hobby of bird watching only attracts a certain generation. There are a number of hides around the inland lake. I sit in one, grateful for the rest, and watch the birds for a while. They are very noisy – squeaking and shrieking and calling to each other. I follow the path just behind the dunes that line the edge of the shingle beach. Sizewell nuclear power station is looming ahead of me. After a while I draw level with the first large building of the power plant. Sizewell B. The white and blue colour – with the pale gleaming dome – are strangely appealing. The sun comes out. A sign informs me of the variety of wild life in the area. Also, it warns me, if I hear a siren sounding, I am to leave the area immediately. Just then I hear the jangling noise of an alarm bell coming from the plant, followed by a loud-speaker. Is this a siren? The voice on the loud-speaker says “Attention all personnel..” but I can’t make out the rest. After a moment’s hesitation, I decide to risk radioactivity and continue onwards. Out to sea are two platforms. They rise, surreally, out of the milky, dead calm sea. I have no idea what their purpose is, but the nearest one is a gathering place for seagulls. After Sizewell B, I pass Sizewell A. This is a much less attractive building. My husband has told me the power station has been broken since March, but I can hear the hum of machinery. The buildings look clean and well-maintained. There are no windows and I can’t see any people working – they must be hidden deep within the buildings. Beyond the power station is a small village and a car park. There are groups of walkers in the car park. They are all wearing the right gear, carry rucksacks and have poles. I wonder where they are going; the map here is crisscrossed with footpaths. At the pub I meet my husband and we have a surprisingly good lunch. 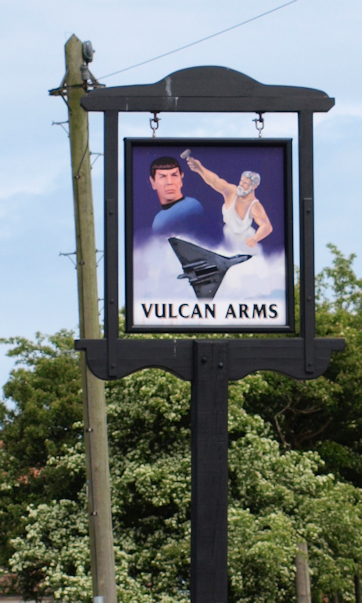 The pub is called The Vulcan Arms and the sign is amusing – as it features the only three things in the universe called “Vulcan”. The pub is quiet. Apparently Sizewell workers are regularly, and randomly, tested for drugs and alcohol. This may not be good for the pub trade but is very reassuring for the rest of us. After lunch, I walk along the top of the low cliff, following the Suffolk Coastal Path and overlooking the shingle beach. I see swimmers in the sea and stop, along with a couple of strollers, to watch them. They are not young – fifty or sixty. Brave people. Round the corner, I arrive at Thorpeness. This is a strange name for this rather upmarket seaside resort, sounding as if it should belong on the wild coast of northern Scotland. The first few houses, elegant and large, are being threatened by the sea. A tractor is out on the narrow beach and workmen in yellow jackets are inspecting manmade sea defences – huge blocks, rocks and wire. I wonder how long they will last. Beyond this, the bay stretches out in front of me and I can Aldeburgh in the distance. I walk along the beach. There is sand below the shingle, firm enough to make walking enjoyable. A family is out and the youngsters are flying a kite while father builds a sand castle. To my right, the shingle rises into a low bank and I cannot see what lies on the other side, but , from time to time, dogs come bounding over, closely followed by their owners. I come across the first groyne I have seen for miles. This appears to be some sort of outflow pipe, rather than a true groyne. I notice how this single, manmade structure, alters the coast line. What would be one, wide, curving bay between Thorpeness and Aldeburgh, as a result of the concrete obstruction interrupting the natural drift of sand, becomes two gentle curving bays. I sit on the edge and eat the rest of my chocolate. Approaching Aldeburgh, I see a strange object on the sand. Ah, this is a sculpture – featuring on the cover of the Ordinance Survey map of the area – and, apparently, loathed by the locals. I walk across the shingle to take a closer look. It is beautiful. I photograph it from every angle. There are words punched into the curving edge on one side. You have to walk around it to read them. I walk along the path at the edge of the shingle. There is a car park here and a number people out enjoying the late afternoon sun. 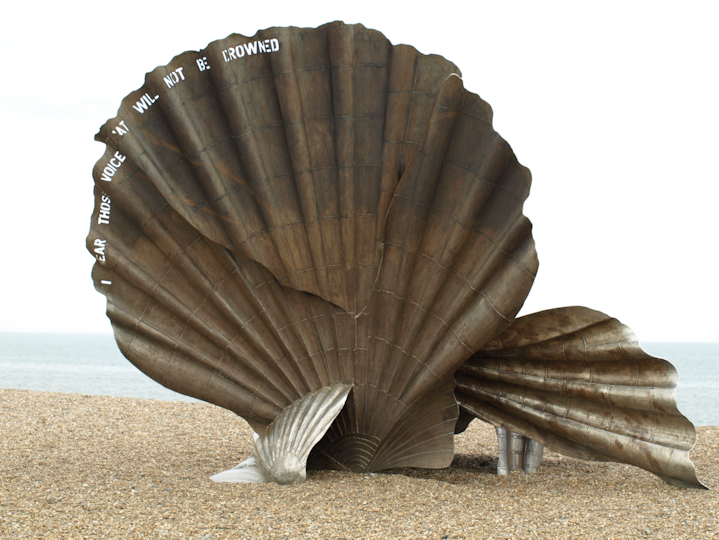 Walking into Aldeburgh is a wonderful experience. The buildings are painted different colours and have weird, quaint architectural features. This town must have been built by people with a sense of fun. By a little boating lake, I notice a statue of a dog. This turns out to be a monument honouring a local doctor, who died in 1959, and his wife, also a doctor. I assume they were GPs. I wonder how many modern GPs will have a stature erected by their patients. Our society has become less appreciative and more demanding. The main street is virtually traffic free. I stroll along it and take photographs – but unfortunately the light is not right to capture this place at its best, the sun is behind the town now. Standing on the sea wall, I notice a man on a bike coming towards me – ah my husband. We walk to the end of the town. 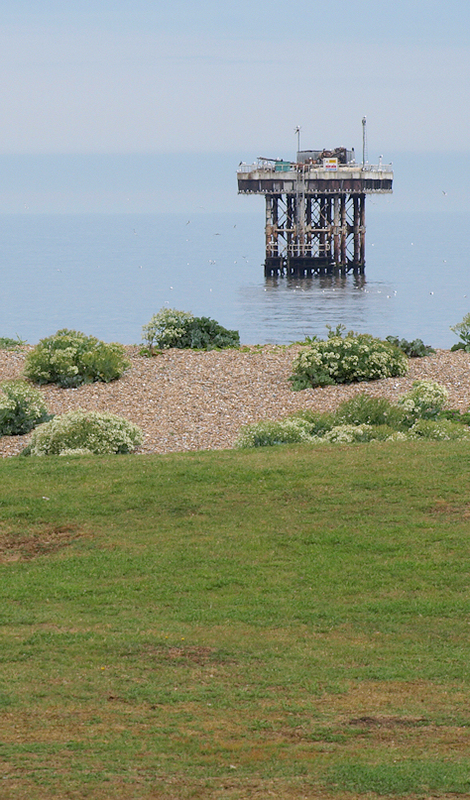 At this point, there is a Martello tower and then a huge, long spit of land – shingle and marshes – leads southwards. Access to the spit is denied and, in any case, the spit is a dead-end. There is no way to access the coast further down, as the coastal route is interrupted by the mouth of the River Alde, which turns into the River Ore, and runs behind the spit until it eventually turns and empties into the sea. Tomorrow, I will be following the official Suffolk Coastal Path and taking an inland route. Solar radiation exposure: 8/10 – mild sunburn. This entry was posted in 03 Suffolk and tagged Aldeburgh, beach, britain, coast, coastal, coastal erosion, hiking, hypochondria, shingle, Sizewell, Suffolk, Thorpeness, Vulcan Arms, walk, walking. Bookmark the permalink. Love the poem! Thanks for sharing Alexis. Aldeburgh was a special place.